In the context of Bush-Cheney-McCain, Clinton’s positions have always been dovish. That was true in 2003, in 2008 and from 2009 to 2013. Clinton is really a mainstream realist. However more hawkish she might be than Barack Obama, she’s certainly no neoconservative. It’s important to remember that as so many prominent Republicans start to endorse her for president. Samantha Power, perhaps the most prominent voice today that argues for liberal intervention was, you may recall, originally an Obama supporter who once called Clinton a ‘monster’). Power, it’s worth noting, is now the US ambassador to the United Nations. It’s true that Clinton talks hawkish, and it’s true that she probably wants to be seen as tough. Is that such a bad thing in American politics? Clinton is 13 years older than Barack Obama, and that’s enough of an age gap to say that she comes from a Democratic generation tagged as weak and unpatriotic because it was too antiwar in 1968 and 1972 (to say nothing of Mike Dukakis sitting in that ridiculous tank in 1988). Maybe gender plays a role too. Maggie Thatcher was certainly viewed as ‘tough,’ and, sure, so was Golda Meir. Indira Gandhi suspended democracy for the only time in post-independence India! Angela Merkel is an East German physicist, and her political style often shows it — it took a decade for Germans to call her ‘Mutti.’ None of that analysis may be fair, I agree, but that’s what it sometimes takes to shatter a glass ceiling. 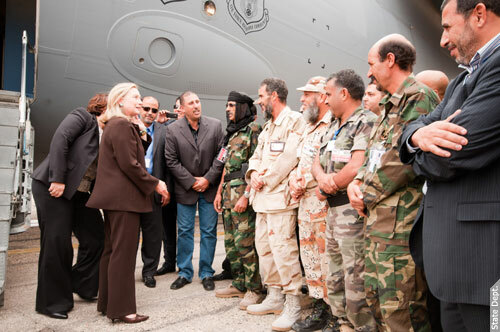 No one will dispute that Clinton’s instincts on Syria were worse than Obama’s, because she probably would have armed Free Syrian Army rebels with American weaponry that would have wound up in the hands of ISIS at worst or Jabhat al-Nusra (now renamed Fatah al-Sham and officially no longer affiliated with al-Qaeda) at best. But it’s not like she wanted an American occupation in Damascus to dismantle the armed forces, alienate the Alawite minority, introduce an unworkable constitution and attempt to create a democratic state on the cheap. In Libya, it’s true that the NATO-led attacks largely facilitated the advent of a failed state (or, more to the point, a collection of failed microstates). But the alternative, for both Clinton and Obama, was to step aside and allow Muammar Gaddafi to massacre thousands of Libyans in Benghazi. If you’d lived in the White House through the 1994 Rwandan genocide, you too might be haunted by the thought of standing aside and doing nothing to stop so much killing. If you’re looking for the next great Clinton doctrine on international affairs, Rice’s words probably come the closest. Previous PostHichilema hopes to win rematch in Zambia’s presidential raceNext PostWho should you want to win the battle for Aleppo?